I don’t think I’ve laughed less at anything Will Ferrell’s been in: any skit on “Saturday Night Live,” any cameo in a Ben Stiller film, any video on the “Funny or Die” site. Once again, the trailer has all the best bits. By which I mean the muted, forced chuckle of Ferrell as he and his compadres, on horseback, watch the cattle graze. That made me laugh. Did anything else in this movie? I’m drawing a blank. Ferrell plays Armando Alvarez, the sweet, somewhat stupid, and somewhat cowardly son of land-rich patriarch Miguel Ernesto (Pedro Armendariz, Jr.), who favors his younger son, Raul (Diego Luna), who, unbeknownst, is a drug dealer in a festering rivalry with Onza (Gael Garcia Bernal). Raul has also returned with a bride-to-be, the beautiful Sonia (the beautiful Genesis Rodriguez), who may or may not favor Armando. There are a lot of jokes based upon the poor production values of Mexican cinema. It’s not like these don’t translate; it’s that they’re not funny. They’re tepid. Either push the joke further or eliminate it. Here, they’re stuck in this bland middle ground. They almost feel tacked on. I’m sure there are in-jokes about Mexican cinema that I just didn’t get. God, I certainly hope so. At the same time, I recall at least being charmed by another Mexican film parody from Hollywood, “Nacho Libre” (2006), starring Jack Black, and directed by Jared Hess of “Napoleon Dynamite” fame. It was sweet, and funny, and focused on that bizarre Mexican cinematic fixation with masked wrestlers. 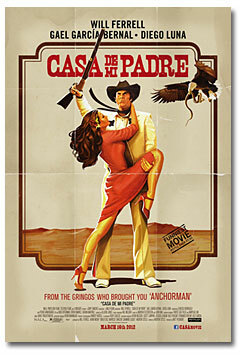 There’s no similar charm in “Casa.” The girl is hot, Ferrell is amusing in a few scenes, and I liked the campire singalong, “Yo no se,” with his compadres. Basically I got five minutes of enjoyment out of an 85-minute film.